Spencer Allen Conway died peacefully at his home in Isla Vista on 9/17/2015 surrounded by friends and family just days before his 70th birthday. The cause of his death was congestive heart failure secondary to Becker Muscular Dystrophy with which Spencer demonstrated a valiant lifelong struggle. A counselor, artist, musician, and dear friend, Spencer was exceptional in many ways and will be missed by many. Born September 27th, 1945 in Long Island, New York to Helen (Binnie) & Everett (Connie) Conway, Spencer’s family moved to California in 1951. Spencer attended Mira Costa High in Manhattan Beach, graduating in 1963. There he formed lifelong friendships with a fun-loving group of surf buddies who brought joy and laughter to Spencer throughout his life. With their help and friendship, Spencer enjoyed many quality years. Thanks to Danny Berry, Jim Calhoon, Johnny Leinau & Wes Herman! Spencer graduated from UCSB with a degree in Geography in 1970, and earned a Master’s Degree in clinical psychology from Antioch in 1996. He worked as a counselor for several nonprofit social service agencies, including Domestic Violence Solutions & Project Recovery. 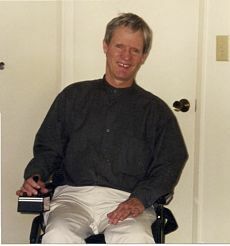 Spencer retired in 2014 from the Department of (Vocational) Rehabilitation and had served on the State Rehabilitation Council in Sacramento for many years. He was a compassionate and insightful counselor, colleague and friend to many. Thanks to dear friends & coworkers at the DOR for their support & friendship through the years! Spencer loved music and worked in earlier years as a professional drummer. Living in the Goleta area since 1963, he was a member of 20+ bands, including The Tridents (1964-1965), The Alexander’s Timeless Bloozband (1966-68) and The Jack McVoutie Band (1978-80). The ATB opened for the Doors, the Byrds, Buffalo Springfield, Janis Joplin, Jefferson Airplane, and Iron Butterfly, among other noteworthy bands. Spencer will be especially remembered for his beautiful watercolor paintings and later photography that he sold at the Cabrillo beach show and Yes Store for many years. Most of his subjects included the ocean he so loved, beautiful sunsets, and local Santa Barbara landscapes. Spencer was remarkable in so many ways. His grit and determination helped him achieve many life goals despite his increasing physical challenges. He spoke up famously for what he believed, whether at work staff meetings or city council meetings. He struggled fiercely to maintain his independence to the end. Spencer lived by his own terms and was ready to walk when he did. Family members were special to Spencer and held a dear place in his heart. Survivors include Spencer’s wife Karen, nephews Eddie (wife Julie) and Mike (wife Kim) Conway, and niece Salli Conway. Spencer was preceded in death by his dear brother, Tim Conway, and his parents. Many thanks to Spencer’s Isla Vista neighbor friends and his team of amazing caregivers for all their help! Spencer had a tenacious spirit but could not have accomplished all he did without support. Although Spencer’s friends are deeply saddened by his passing, they find joy in knowing that, after so many years of physical struggle, Spencer can finally walk again. Spencer cared deeply about the health of our oceans, forests, and wildlife. His passion for surfing was a measure of his love and respect for nature and particularly the ocean. Spencer was fearlessly outspoken when it came to defending the environment. In lieu of flowers, donations can be made to: SB Community Environmental Council (cecsb.org), SB Channelkeeper (sbck.org), SB Environmental Defense Center (edcnet.org), or SaveTheRedwoods.com. A memorial service will be held at a future date TBA.